Sitaram group prides itself on its focus and maintenance of the high quality of all its products. The biggest reason behind our success and our strong customer loyalty is our uncompromising attitude towards quality. We have well defined and stringent quality checks throughout our manufacturing process where all employees from top to bottom are responsible for the quality of material that passes through them in the production process. We have a state of the art testing laboratory where we regularly check pipes and fittings in production to ensure that they meet all the international standards and are of good quality We continuously invest in R&D and our infrastructure to ensure that both our production systems and testing technology are absolutely latest to serve our customers with best products possible. Nirmaan Pipes is one of the leading manaufacturers of uPVC Riser / Drop / Column Pipes that are being successfully used in the erection of deep bore submersible pumps. Power Lock™ : Nirmaan Column pipes are fitted with non metallic Power Lock™ system. This provides extra safety to the system during pump operations. Square Threads : Square Threads are made using high quality CNC machines ensuring accurate threads. This provides high load bearing capacity. U MEP™ Technology : Developed using Ultra Molecularly Enhanced Polymer(U MEP™) Technology, an Ultra hi-tech process that orients the PVC molecules both in the axial & circumferential directions resulting in a pipe with enhanced impact strength & flexibility. "T" Ring : Specially designed "O" ring that provides cushioning effect to the coupler making installation easier & damage free. 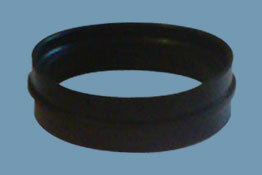 The ring also serves to provide a leak free joint and absorbs the vibration of the pump. Nirmaan Plumbing Pipes are manufactured in strict accordance to the standards ofASTM D 1785 and threaded to match G.l. Pipes as per IS : 1239 (Part-i) or 15:554. Nirmaan plumbing pipes provides a significantly cheaper. maintenance free and easier to install alternative compared to GI Pipes. 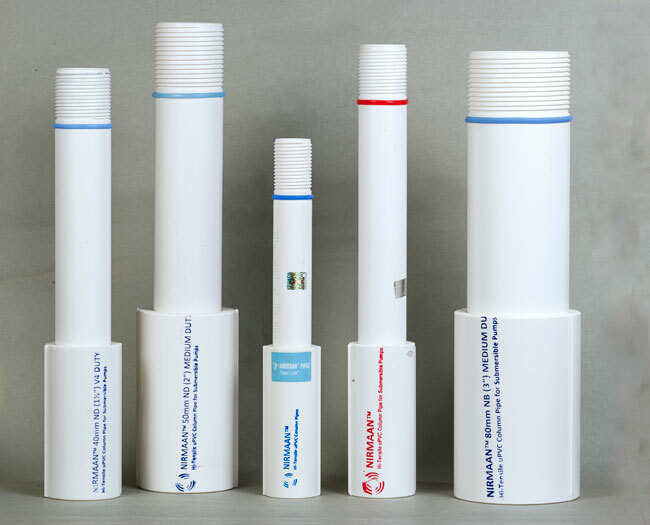 These pipes are extensively used for water connections and other fluid transport for both domestic and industrial purposes. 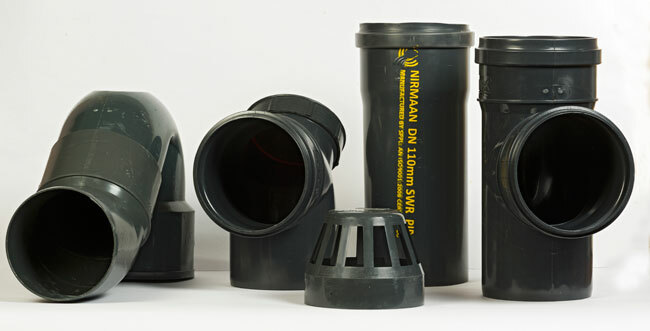 Building Construction : Nirmaan Plumbing Pipes are widely used for water connections to bathrooms, washbasins, kitchen sinks etc. Portable Water Supply : They are used in individual homes, multi-residential buildings, commercial complexes and offices, hotels, hospitals, governmental buildings, transport terminals etc. 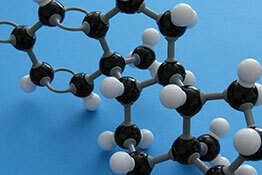 Industrial Applications : They are also popular in agriculture, telecommunication, irrigation projects etc. 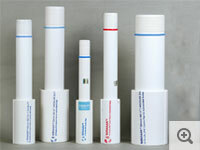 They can be used for distribution of chemicals, gases and milk etc. in plants, industrial estates and dairies etc. These pipes come with both single and double sided threads. 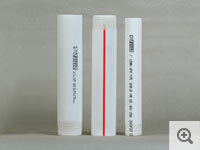 Fluro Plastic tapes are used on joints while connecting these pipes to avoid damage and subsequent leakage. 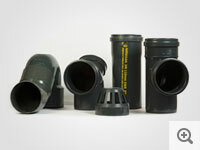 These pipes are light and flexible providing quick and easy jointing. 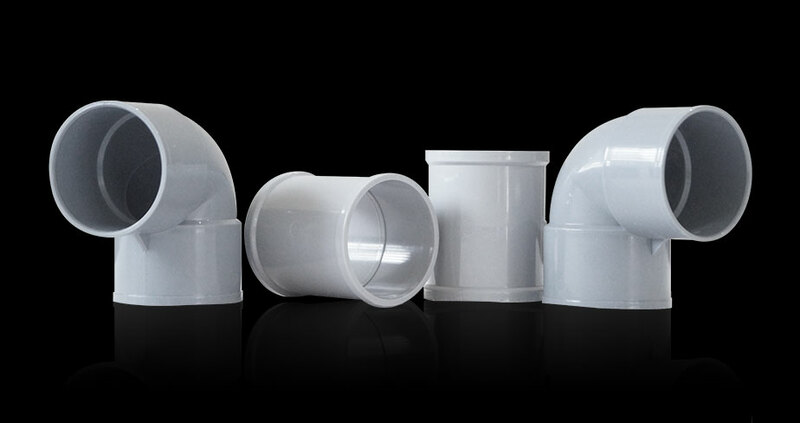 They can be joined to both metal pipes fittings as well other UPVC pipes and fittings. No special equipment is required for installation and the method is significantly easier and less time consuming than that for metal pipes. Nirmaan plumbing pipes are tough and durable and have strong resistance to corrosion, wear and abrasion, chemicals, weather effects, moisture etc. These pipes have a smooth internal surface providing low frictional loss and efficient transport of fluids. SR Soil, Waste & Rain Water (S.W.R.) drainage systems provide an effective solution for drainage & sewerage applications, owing to its superior properties compared to conventional drainage systems. Nirmaan SWR Pipes are manufactured in strict accordance to IS: 13592/1992 standards. These pipes are available in both single and double socketed ends in various lengths specified below. These sockets come in both plain solvent cement type as well as. Rain - These lines are generally connected to gutters on roof tops for drainage of excess rain water. Soil / waste - These lines are connected to the different excreta generation points such as lavatories (Basins, commodes etc) and kitchens (sinks etc.) for smooth transportation of soluble and in soluble waste along with water to main drain lines. Nirmaan provides both rubber ring joints as well as plain solvent cement type joints for its SWR pipes that provides easy jointing based on the choice of the customer. These pipes are lightweight, flexible and come in various lengths that provides a convenient, time saving as well as cost effective solution. The pipes have a smooth internal surface, are corrosion and weather resistant that provide excellent flow properties through the pipe. 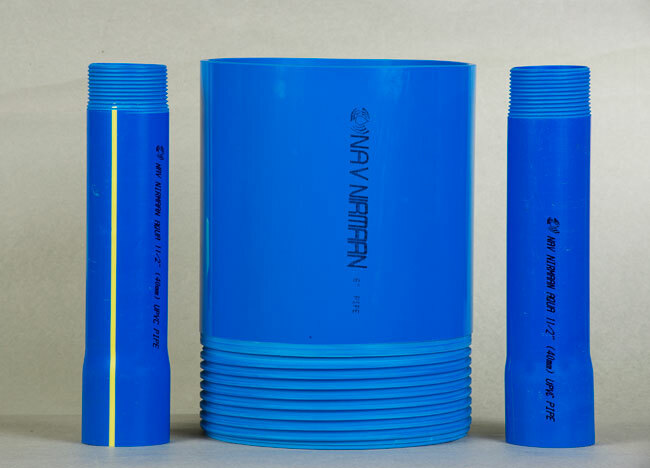 Nirmaan Casing pipes are widely used for bore-wells, irrigation, chemical distribution etc and can be installed n vertical, horizontal or inclined positions. 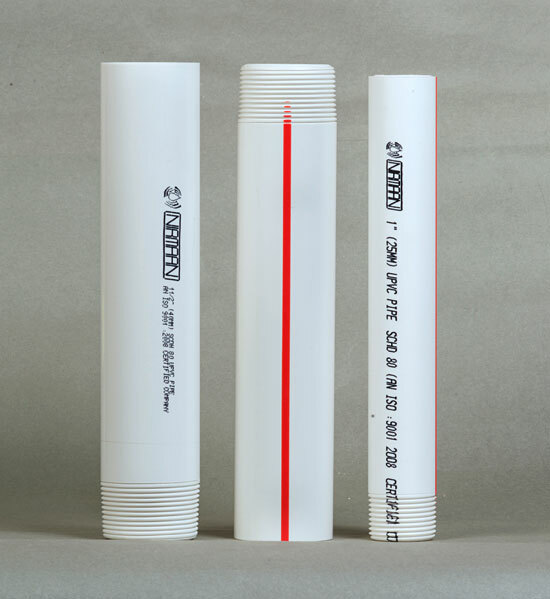 (i) Plain Casing Pipes : These are generally used as extension pipes to screen pipe They are of two types C. S. Pipe For shallow-depth (up to 80 m) red colour code. 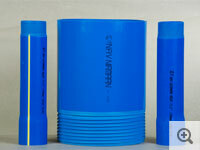 C. M Pipe For medium -depth (up to 250 m) yellow colour code. (ii) Screen Pipes : These pipes may be plain or ribbed. They have transverse slots and are mainly used in bore wells, from the water-table Level onwards. (iii) Ribbed Screen Pipes : These pipes have longitudinal ribs and transverse slots. The ribs keep granulated Soil away from the slots and increase the permeability rating to more than double when compared to plain screen pipes. Casing pipes are primarily used for Bore-well Casing, Irrigation. Domestic wells, Industrial mining. Chemical Distribution etc. UPVC casing pipes provide a significantly cheaper, longer lasting and maintenance free alternative to MS. ERW, GI, Asbestos, and SS Pipes uses for similar applications. These pipes are manufactured with very good quality internal and external trapezoidal threads and bell-spigot ends, which ensure easy and reliable joining. 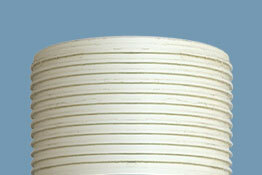 Ribbed screen pipes are generally used to increase the outer surface area of a bore-well casing pipe. The ribs provide around 25% additional surface area by holding the gravel balls away from the pipe. at a distance of about 2mm. This arrangement cleans slits naturally due to vertical flow passage and allows more water to seep in that results in higher yield of water than other plain screen pipes with the same bore. These pipes are made with extremely smooth internal surface that produces minimal hydraulic friction facilitates easy transport of water. These pipes have strong resistance to harsh weather and environments of salt, acid, alkali, oil etc and can handle a wide range of pH values enabling their uses in wells, tube-wells, bore-wells in all kinds of soil and terrain. Their biggest advantage to metal pipes is their immunity to galvanic or electrolytic erosion and their maintenance free long usage life making them ideal for transport of potable water. Pipes : Nirmaan Grey Pipes are manufactured according to IS 4985/2000 .These pipes are used in varied applications ranging from Agriculture to Sanitation. Their low cost and high strength features have made them popular with farmers, government departments and industries for transport of both potable and non-potable water. 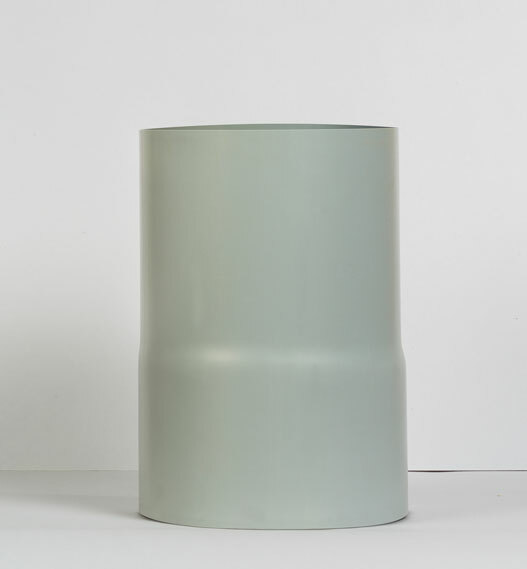 Fittings : Nirmaan Grey Fittings are manufactured according to IS 10124/1988. We manufacture all types of fabricated fittings like Socket, Tee, Bend, End Cap & Flanged Tail Piece. The Selfit (Solvent Cement joint) pipes have one end self-socketed and the other end plain.